In this video I wish to share my commentary on a YouTube video called "BLACK PANTHER EXPOSED: Witchcraft Served to the Black Community" posted by a YouTube channel by called Truthunedited. The video was Published on Feb 23, 2018. The link to this video is in the description below. My commentary is in no way a defense of the Disney/Marvel movie, I simply wish to express my thoughts on the concepts presented in this video as a rebuttal to the premise that this movie, like so many others, contain what is commonly called by Christians "witchcraft". I wish to express some of the obvious parallels between commonly held Christian precepts and dogma that are enshrouded in so-called pre-Christian practices. The Movie, Black Panther has served its purpose of creating debate, controversy, disgust, disbelief and even the loss of friends, family and associates. Like in the political spectrum, one is hard pressed to speak against it as it will garner outrage that one would be so deft as to not see the historical impact and paradigm shift it has and will continue to create. It has aptly captivated the minds of those who were seemingly awake and brought them back to slumber and the minds of those already slumbering into an even deeper slumber. Along with that is has topped box office expectations within the first two weeks reaching the 1 billion dollar record for any Marvel Comic Universe movie. It has been creatively marketed to entice and has altered the minds of those who view it. This fantasy has created a paradigm shift towards the support and acceptance of what Hollyweird can do to change the image of a people from powerless to powerful, all amidst the backlash of Hollyweird scandals. People who heretofore were reticent to support anything "Hollywood" have changed their minds and now support Hollywood's attempt to create a so called better image of Africans and African descendant folk. Even the most skeptical have reached into their pockets to pay the piper for this hypnotic song. They argue that while they are aware that it is just a fantasy, that it can still have an impact on how Hollywood will treat its People of Color with more respect, dignity and adulation, thus opening the door for more People of Color to advance beyond the racist epithet that is Hollywood, hands down. They argue that now People of color can have more opportunities to be in the limelight, when heretofore, they conveyed a deep concern for the Hollyweird lifestyle, its extravagance, its discrimination, its scandals and its misrepresentations of People of Color. I will not go further on this aspect but will now shift my focus to the video mentioned previously and that is, "BLACK PANTHER EXPOSED: Witchcraft Served to the Black Community" posted by a YouTube channel called Truthunedited. Let me start by saying that your video was very well done. It contains a lot of truths that resonate with me. The depictions and graphics were well placed and the message carried through until the end. However, when you began to discuss witchcraft and how the movie was leading people away from the Bible and towards the ancient spiritual customs of Africans… it took me aback. I find it quite interesting that anyone of African descent in Africa or in the Diaspora can take the religion of the oppressor. The imposition of Christianity into the African experience was brought by "white missionaries" and the black guns of the imperialistic invasion of the colonizers, who all over Africa are seen erected and honored in Churches in the face of a "White Jesus." The colonizers skillfully duped the Africans into believing that a White Jesus, not their indigenous gods, ancestors or nature spirits, would save them from their "sins" which were only sinful in the eyes of the European colonizers. They brought the concept of "sin" to Africa and the need to eradicate it through their pre-ordained notion that a "White Jesus" could do this for them. Christianity as it is brought to us in which it warns against witchcraft in my estimation, is patently disingenuous. The very thing that is supposedly "evil", against "God and his ordinances", spawned by Satan himself… are all done in the Bible by people of God, prophets of God and even "Jesus" himself. I find it quite ironic that while pointing a finger at other religions who worship idols and who acknowledge the Ancestors, that Christians find a departure from doing the same when they do it. Christians often separate themselves in their piety from the rest of humanity while turning a blind eye to their very own customs, rituals and beliefs. 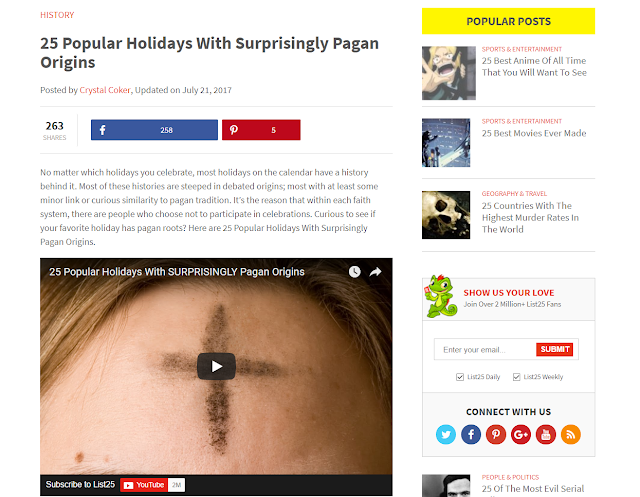 Just doing some background research on some of the most popular Christian Holidays, should draw a conclusion that 1) Christianity has borrowed much from its "pagan" counterparts and 2) the miracles are magic, slights of hand, indisposed superstition, and tricks that are akin to pagan practices, not a departure from it. Placing a Christian mantle over a pagan ritual, holiday, custom, practice etc., does not make it less pagan. It actually gives it a cover, ingratiates it, protects it, honors it and sustains it. Pre-Christian Pagan roots can be seen in many contemporary Christian holidays. "No matter which holidays you celebrate, most holidays on the calendar have a history behind it. Most of these histories are steeped in debated origins; most with at least some minor link or curious similarity to pagan tradition." The Christmas Tree; Celebration of Nimrod. Evergreen trees were important fertility emblems for pre-Christian ceremonies marking the winter solstice. New Years Day; the victory of the sky god Marduk over the sea goddess Tiamat. I could go on and on with the many depictions of magic and witchcraft featured in the Bible and connect them to pagan practices that predate Christianity. The idea that a "Savior" is needed to save humanity from their sins is the most deep rooted ploy played "against" humanity in whatever religion it manifests, because it takes sovereignty from the individual and places it in the hands of someone else who then becomes responsible for the individuals behavior. Thus Kings, and rulers and gods are herald as the salvation of the people instead of the people taking responsibility for their own behavior. This is a trap of incessant control over the masses as the masses will become entrapped in a vicious cycle of shirking their responsibility, falling into guilt, being redeemed and then continuing in the same vain, again and again. With all the outstanding research that you have done and the many correlations that you provide in your video, it astonishes me that you have not come upon, or if you have, you have not expressed, the many correlations between what happens in the Bible as it relates to what you refer to as "Witchcraft" in the movie Black Panther and the blatant exemplary depictions of "witchcraft" in the religion called "Christianity." One of the problems with this type of docu-video-info-research, is the mixing of things in such a way that the truth is so apparent and blatant, the untruths or lack of research become veiled. This methodology has the viewer in such a state of "belief" they miss the disinfo. This methodology is very, very dangerous, I might add. I will conclude my comment with a reference to my video where I analyze the correlations between what Christians call "witchcraft" and what their "Savior" did. Are You Involved In Witchcraft and don't Even Know It? "BLACK PANTHER EXPOSED: Witchcraft Served to the Black Community"